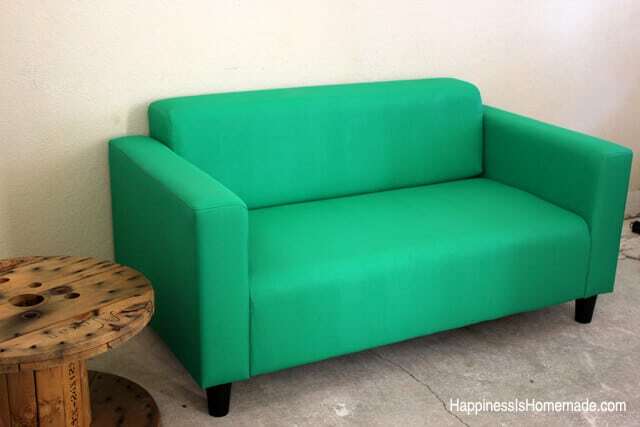 Lately I’ve seen painted sofas, couches, loveseats and chairs of all sorts popping up on Pinterest. 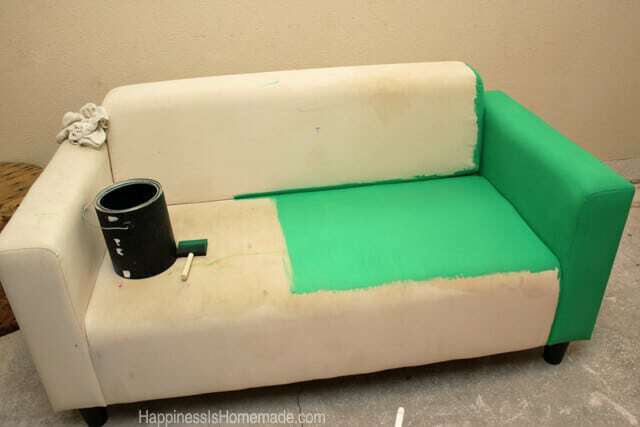 My imagination was sparked, and I knew immediately that I wanted to attempt to paint a dingy old Ikea loveseat that had previously lived in my boys’ playroom. We’re re-doing our entry room (hence the concrete floors and ripped off baseboards in the photos below! 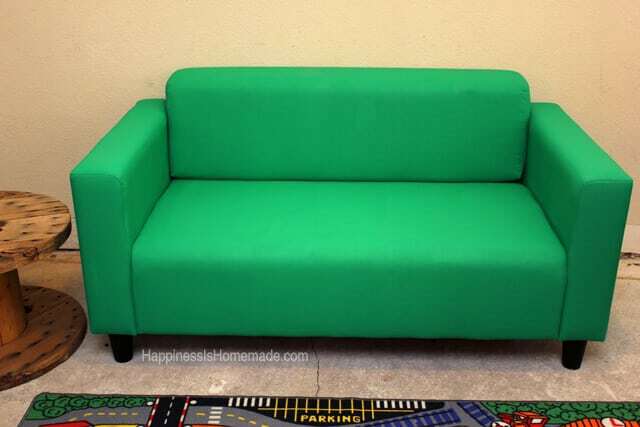 ), and I wanted to give the sofa a new home there. I was intrigued by the idea of using chalk paint to give my loveseat a makeover, but I also didn’t want to spend a lot of money buying expensive supplies that I didn’t already have on hand, so I came up with another plan. 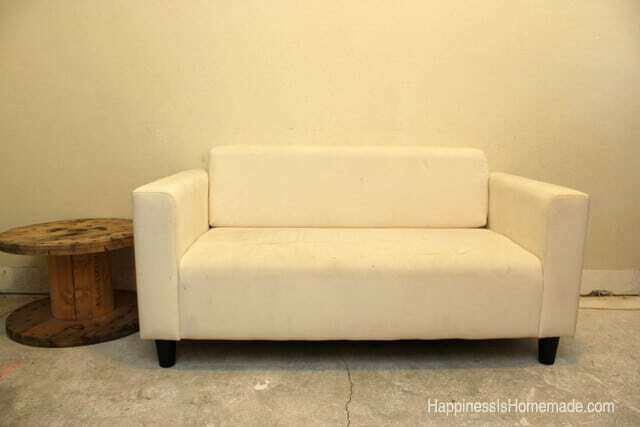 I started with this cream colored loveseat from Ikea. 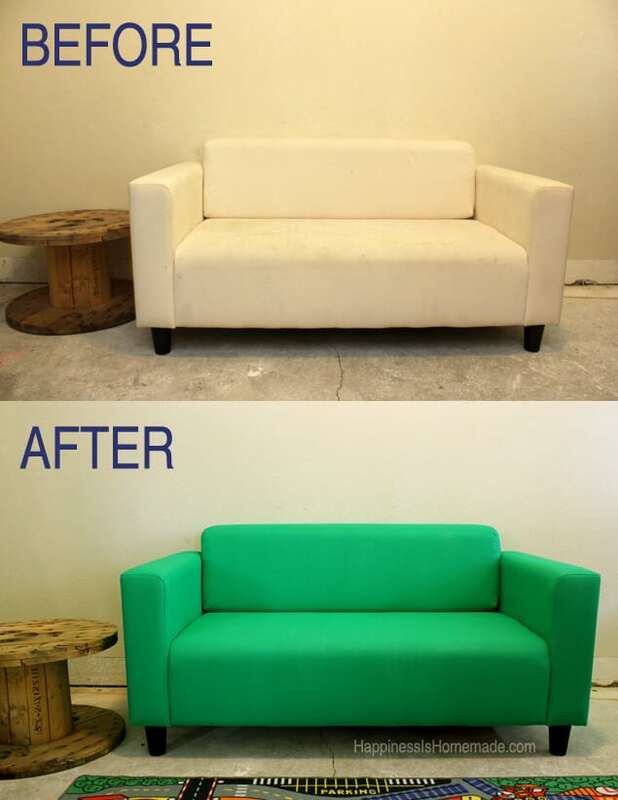 I had always intended on getting a slipcover made for it…until I discovered that they cost around $250! Like I said, it used to hang out in the boys’ play room, so even though it looked okay from a distance, it was a dingy mess up close. See what I mean? This photo doesn’t even show how bad it actually looked in person. It was covered with loads of dirty spots and a few lovely splashes of green highlighter (thanks, Simon!) and marker. 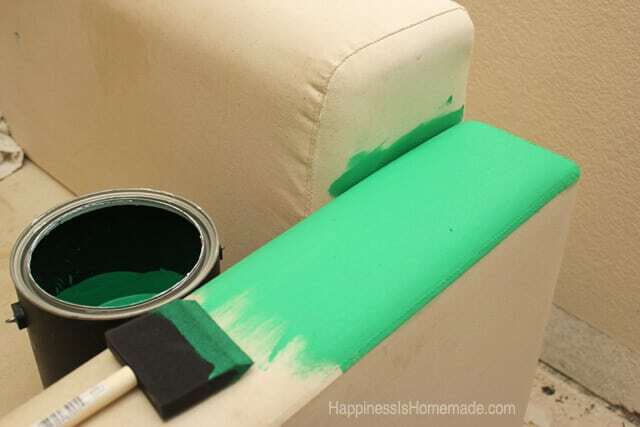 I literally had a dream about painting the couch an emerald green, but during the following weeks I went through TONS of paint chips, and could never find a color that was just right. Last week my husband was cleaning out the garage and ran across some old cans of paint that a neighbor had given to us awhile back. 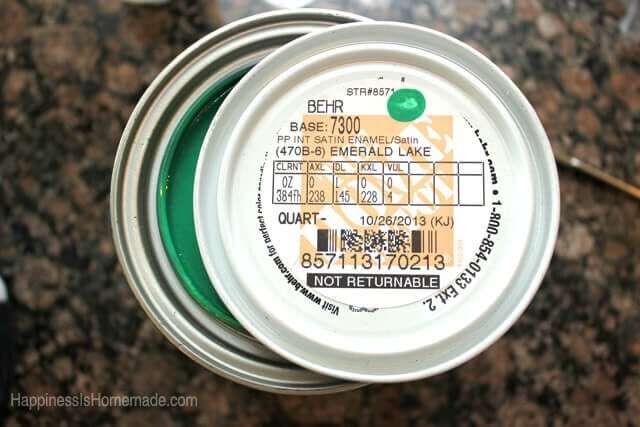 Lo and behold, in the stack was a can of “Emerald Lake” paint that was JUST what I was looking for! Seriously, I opened that can of paint and gasped out loud – it was like I opened the can and heard angels singing a chorus of Hallelujah! Exactly the shade I was looking for! Unfortunately, that can of paint was a high gloss exterior paint, so I took the formula down to Home Depot and had them color match it in an interior satin. 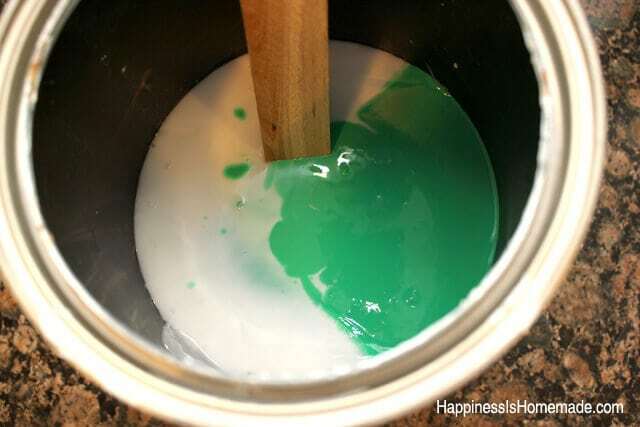 I mixed the quart of paint with 16 ounces of fabric textile medium. This allows the latex paint to permanently bond to the fabric while staying softer, less stiff and resistant to cracking. You can pick up the fabric medium at most craft stores – be sure to use your weekly coupon! You will need two 8 oz bottles of fabric medium for every quart of paint used. 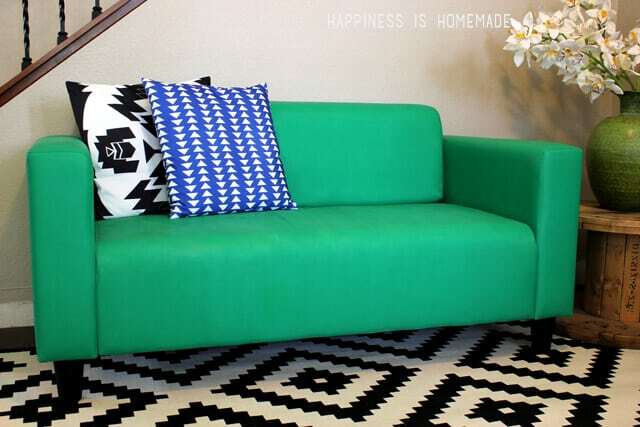 Start by spraying a section of the sofa with water and allowing it to penetrate the fabric. I sprayed my loveseat a section at a time and allowed it to sit for about five minutes before painting. I used a 3″ foam brush which worked perfectly on the canvas-like fabric, but if your couch has a looser weave or more textured fabric you will probably do better with a regular paintbrush (I’d recommend this Purdy brush – they’re pricey, but they last forever!). As soon as I painted this little swatch I fell in love with it! 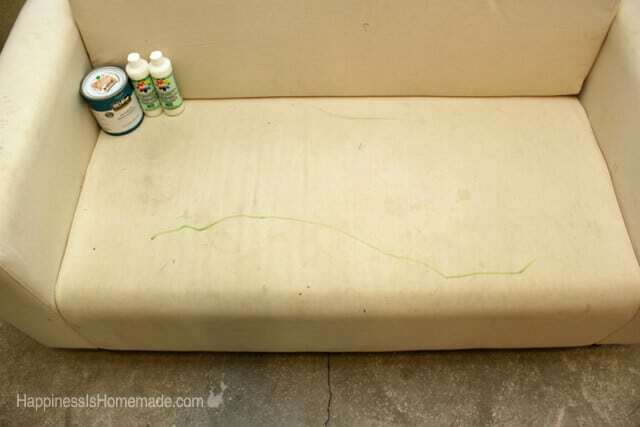 Continue to alternate spraying the couch and working section by section until the entire piece is painted. Pay attention to your brush strokes, and paint with the grain of the fabric. After the first coat – it definitely needed a second coat to provide more even and solid coverage, but I was already thrilled with the way it was shaping up! The process was a LOT quicker than I thought it would be too! It took about an hour and fifteen minutes to paint the first coat, and then I left it to dry completely overnight before adding a second coat. After a second coat it was smooth and gorgeous! Any color variation that you can see in the photos is just from shadowing and sunlight in the room. I can’t believe this is the same sofa! It seriously looks a thousand times better than it did before! I’m sort of giddy that I rescued it from the To-Be-Donated pile and gave it new life! I tested it out and rubbed the entire loveseat vigorously with a piece of white fabric, and there is NO paint transfer! I won’t lie and pretend that this is going to be the comfiest couch ever. It feels just like what it is, painted canvas, but I’ve read that over time it will soften up a bit. It can also be sanded lightly with a fine grit sandpaper to add more softness to it, but since this loveseat isn’t one that we sit on very often, it will work perfectly for us. UPDATE: The sofa is still going strong after nearly 8 months of daily use! Come check out how awesome it looks in our newly made over front entry room! If you attempt to paint one of your furniture pieces, I’d love to see it! Come share it on my Facebook page or drop me an email at [email protected]! I can’t wait to try this!!! I’m a photographer. Buying the ugliest vintage loveseat you’ve ever seen and painting cream for Santa pictures with little ones. I want to paint my red suede couch over again because the sunlight has faded it along with dirt spots. What paint do you recommend?? Could I paint any kind of fabric on a couch? Different fabrics will require different types of paint. For vinyl or leather, I highly recommend Angelus leather paint. Bless you for posting for this! 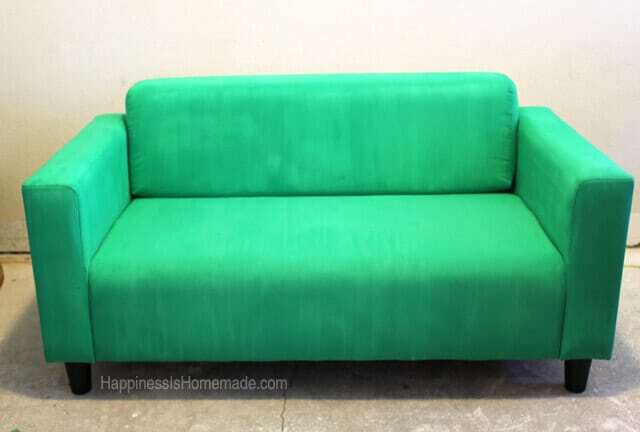 I read the comments and did not see if your finished the green sofa with an polyurethane sealer or wax sealer. Heidi , we painted our love seat last year in a tan , it’s exactly as you described , perfectly fine and I would like to now change the color What are your thoughts on painting over my painted loveseat ?? I Love this idea! 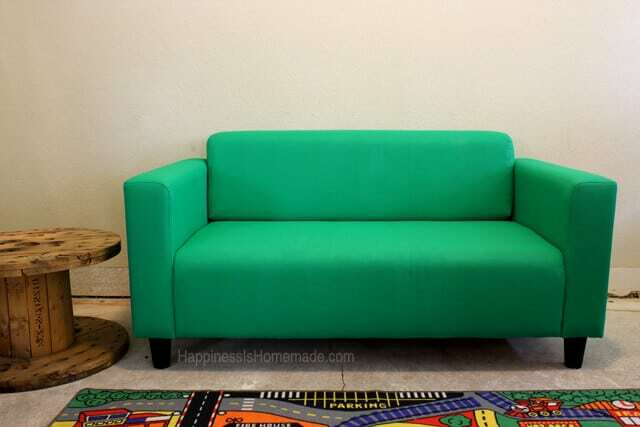 I am not ready to purchase a new love seat and don’t want to spend several hundred dollars on a slip cover that will do until I but a new sofa. My question: My sofa is a tan and lighter tan colour stripe. Will a ‘patterned’ fabric still work well painting to one colour, or would I need more coats? What would the maximum coats suggested. Two?